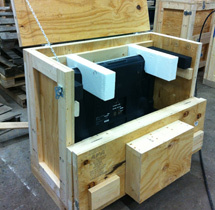 All boxes and crates are custom manufactured per the customer’s specifications. No matter the size or weight of the item you need to ship, we will design a packaging solution that will ensure your product makes it to its final destination safely. 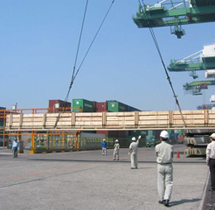 We are capable of packaging domestic and export shipments at our facility or yours. We take the guess work out of how things should be packaged, blocked, braced, and supported to ensure your products end up at their final destination undamaged. 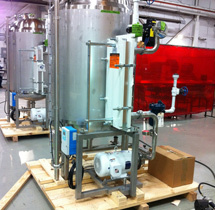 Goehner Industries manufactures light and heavy duty skids, decks, and saddles in the quantities you need. 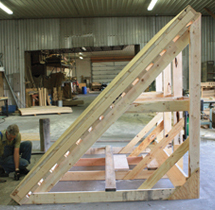 We are proud to offer a full range of industrial grade packaging and containers: wooden boxes and crates, overseas containers meeting military specifications, heat treated and ISPM-15 stamped export packaging, customized skids and decks, dimensional lumber, custom cut stock, and on-site packaging. We are able to not only package products for export, but stamp all wood packaging material destined for any location around the world. No matter the size or weight of the item you need to ship, Goehner Industries will work with you to design a packaging solution that will ensure your product makes it to its final destination safely. We can package domestic and export shipments at your facility ensuring your products end up at their final destination undamaged. Here's what some of our satisfied customers are saying. © 2014 Goehner Industries. All rights reserved.